offSIDE is back with a special edition, loaded with sneak previews of three exciting new works from Black Moss Press! We’re featuring poems from MARY ANN MULHERN’s “How We Fare” and JOHN WING’s “I’ll Be There Soon”, as well as short stories from “Twelve Miles to Midnight”, a new collection ANDRE NARBONNE. All three titles are slated for spring 2016 release, but you can get an exclusive look in this issue of offSIDE! Click here to read on issuu. To celebrate National Poetry Month, offSIDE is back with exciting features & new unpublished poems from across the country. Featuring two up-close looks at fresh Black Moss releases by JOHN B. LEE and VANESSA SHIELDS. Our friends at Biblioasis provide us with some great visuals from RINO’s KITCHEN. And of course, new poetry by PENNY ANNE BEAUDOIN, TERRY ANN CARTER, KAREN ROCKWELL, and JESS TAYLOR. It’s all available right here on issuu. Read, enjoy, and share! Well in the making! offSIDE returns with a facelift, new features & contributors, and of course the new & the unpublished from all over Canada. JOHN WING JR. is our cover story, as we spill all the details on his new book and feature poems slated for its release. That plus new and enlightening work from JANE OZKOWSKI, CARLY BUTLER, VANESSA SHIELDS and more. A belated Happy New Year to all of our readers! We hope sincerely that your 2012 was wonderful and 2013 is more of the same. A new offSIDE will be taking shape in the weeks to come – we’ve already earmarked some great new material and the search for more continues. But we can’t do it without you. Whether you’re a first-time contributor or have submitted in the past, we want to see your work in our inbox. Click here to view our submission guidelines or take a look at our November issue to see the kind and quality of work we love to publish. Back from extended, extended summer vacation, offSIDE returns with our November 2012 issue. We’re proud to present a great selection of poetry from Vanessa Shields, writer/comedian John Wing Jr., Shirley Limbert, and Dennis Robillard. We’ll also feature the photographic work of Emily Buta and new writing from emerging talent in Emily Fraser-Jeffries and AJ Nogueira. Overdue perhaps but never underwhelming, you can click the cover to get it all or download the pdf. Your comments and feedback are forever encouraged, so email offsidezine@gmail.com or tweet us at @offsidezine to get in touch. We’ve been busy here at offSIDE working on our May issue. It is just about ready to be released, but we figured we’d tease your taste for innovative writing and photography a little by giving a little glimpse into our brand new issue. Click the image below to sample the May issue, and stay tuned for the full magazine, appearing right here very soon! That’s right, offSIDE‘s March 2012 issue is now here! We made you wait a little while for January, so to make up for it, you get our March issue five days early. We’ve been previewing our new format for the last few weeks, and today we are proud to finally launch the completely re-designed offSIDE. This month we have photography from the talented Leesa Bringas, interviews with Mary Ann Mulhern and Terry Ann Carter about their forthcoming Black Moss Press books, Brides in Black and Day Moon Rising, as well as an interview and poetry from TOAST Open Mic Poetry host Josh Kolm. We also have some fantastic poetry from Amanda Earl and Kevin Shaw. 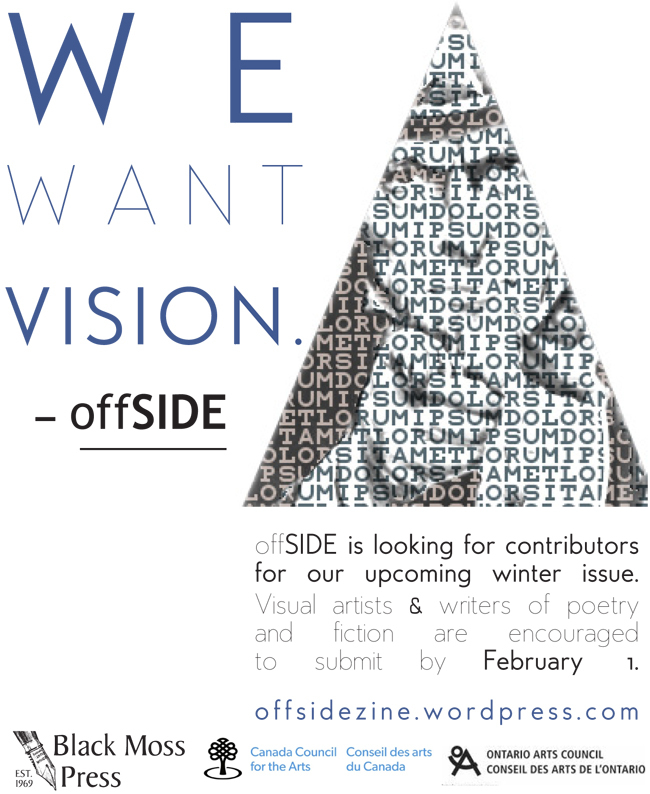 Make sure you let us know what you think of the new re-design, as well as this month’s content, either by commenting here, or sending us a message at offsidezine@gmail.com or on Twitter @offsidezine. Click here to download a .pdf file of the new offSIDE. We have another preview for you today at offSIDEzine.wordpress.com! Check out the cover to our brand new issue coming soon, featuring art by Leesa Bringas. Check out this preview of offSIDE March 2012, featuring our brand new design. What do you think of our new look? offSIDE March in its entirety will be here March 1, 2012, so watch this space! Click the image below to see the rest of the editor’s letter and more of our new look.